It is a very simple and easy traditional recipe. You can use any kind of small fish (choto mach) for this recipe. I used mustard paste in this recipe. If you are living overseas, you can use hot English mustard paste to make handy. Puti mach is in English Puntio Barb. 1. Take the pan in which you will and add fish and all the ingredients except cumin powder and coriander leaves. Mix well and add ½ cup water. 2. Now turn on the heat and cook it under closed lid on medium heat. 3. When water dries up, add cumin powder and coriander leaves and check salt. 4. 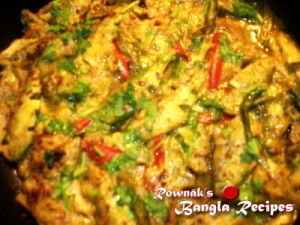 Serve Puti Macher Chorchori / Spicy Small Fish /পুঁটি মাছের চড়চড়ি with plain hot rice. Excellent Receipes,please keep me posted. REALLY GOOD AND MOUTH WATERING RECIPES. PLS SEND MORE NEW RECIPES. THANKS SO MUCH.